Snack Food Slavery: We’re all enjoying it. What? Not me. No way! Slavery is bad. Yeah, but … you’re still part of the problem. We all are. Soda and chips … sugars and fats … vegetable oil … palm oil … slaves and rain forest exploitation. So, if you buy products from those companies or have money deposited with those banks, you’re helping fund the slavery food chain. 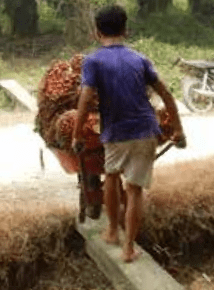 You don’t want to but that food chain requires people to harvest and carry 2 tonnes of palm nuts for about €5 every day. That’s slavery. What can you do about it? It’s hard. We all support the pyramid of power. It’s pretty hard to live in this world without being part of the system. I’m part of the system, even if I don’t like it and I want to change. So take a step in the right direction. Share the knowledge. Your voice helps accelerate change for good. Buy less snack food. Eat locally grown food. Make your bank aware that you know they fund this pyramid of human slavery and you don’t like it. Do the right thing the right way. Investing your portfolio: Where are the customers' yachts?